All tiers are general admission. A limited number of tickets are available at each tier and will be sold on a first-come, first-serve basis. If an event does not sell out in advance, tickets will be available for a higher price at the door. Jantsen is no stranger when it comes to electronic music. This Boulder, Colo., native has been fully immersed into the dance music scene for more than 15 years with his passion later blossoming into DJing and producing. Over the years Jantsen has established a strong presence in the scene through his eclectic sound, being influenced by many genres such as jazz, blues, funk, rock, hip hop, and many other kinds of world music he brings a style that is creative, unique, and is continuously evolving. 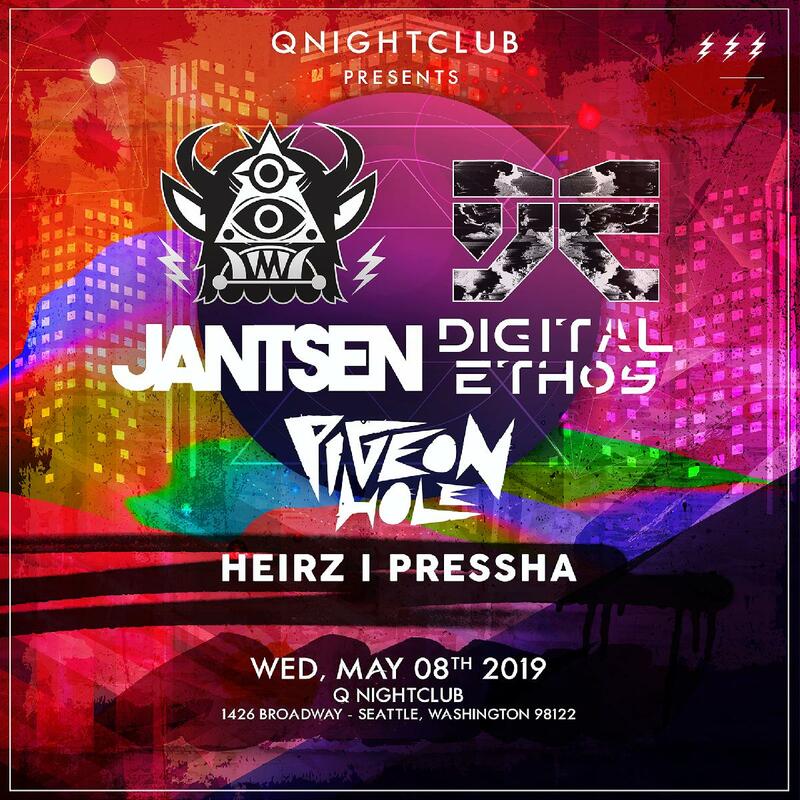 Jantsen’s enthusiastic personality shows through his DJ sets through his fun, energetic, and contagious stage presence. This bass driven all star has collaborated with acts such as Bassnectar, Dirt Monkey, Luzcid and has gained international support from some of the scenes top DJ's. Digital Ethos, aka Charlie Quigley, is a South Jersey based electronic music producer. With a heavy hip-hop influence, this free-form bass artist pushes the boundaries of modern sound, to create something for the future. Vancouver Island duo Pigeon Hole first forged their name in the underground hip hop culture of the mid-2000s. From there, the drive to experiment with new forms of production saw them splinter off from rap onto the fringes of the bass music scene. True to their roots, Pigeon Hole’s sound leans heavily on nostalgic reference to their early hip hop influences; establishing themselves at the forefront of Canada’s Bass music scene with their new approach to the genre.